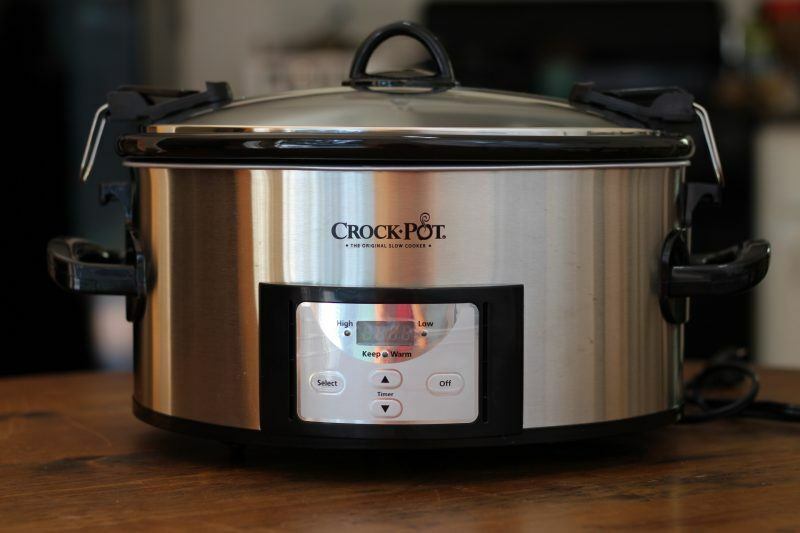 Top Five Crock-Pot Slow Cookesr Reviewed , Cuisinart Slow Cookers, and Maxi-Matic Slow Cookers. Update: We've just publishes reviews for West Bend & Bella products as well as Chefman cooker reviews and Tiger Corporation slow cookers too! 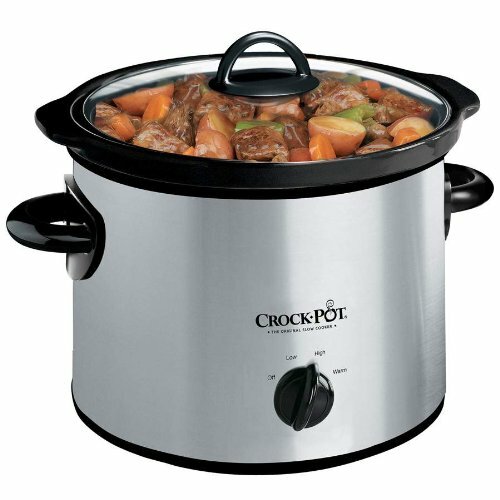 This newly released slow cooker has taken the market by storm, instantly becoming a highly sought-after pick. The versatile multi-cooker has five different settings: slow cook, roast, bake, brown/saute and steam. You can program a slow cook time for up to twelve hours on high, low or warm and, if you want to turn on the slow-cook mode after browning your meat, for example, a simple touch of a button will do the trick without having to transfer your ingredients from one pan to another. The non-stick six-quart crock, the glass lid and the dual-position roasting/steaming rack are all dishwasher safe for easy cleanup. Even a basic slow cooker can minimize the hassles normally associated with preparing your own meals at home, but this savvy model takes easy cooking to a whole new level. Now, you really can make multistep meals using only one pot. This countertop appliance also comes in handy as an extra oven or stovetop when your other kitchen appliances are in use. The baking setting has a temperature range of one-hundred-fifty degrees Fahrenheit to four-hundred-fifty and the saute feature can be set to a high or low heat. The fact that the slow-cook setting only runs for twelve hours may be a drawback for some consumers, but many are unfazed by such a limitation. Overall, this high-end model is ideal for individuals willing to pay extra for multi-cooking capabilities. With a programmable digital control that allows you to select a cook time of anywhere from thirty minutes to twenty hours, this six-quart appliance can be set to high, low or warm. Once the selected cooking time is complete, the model automatically shifts into warm mode for up to six hours to keep your dish at a ready-to-eat temperature. 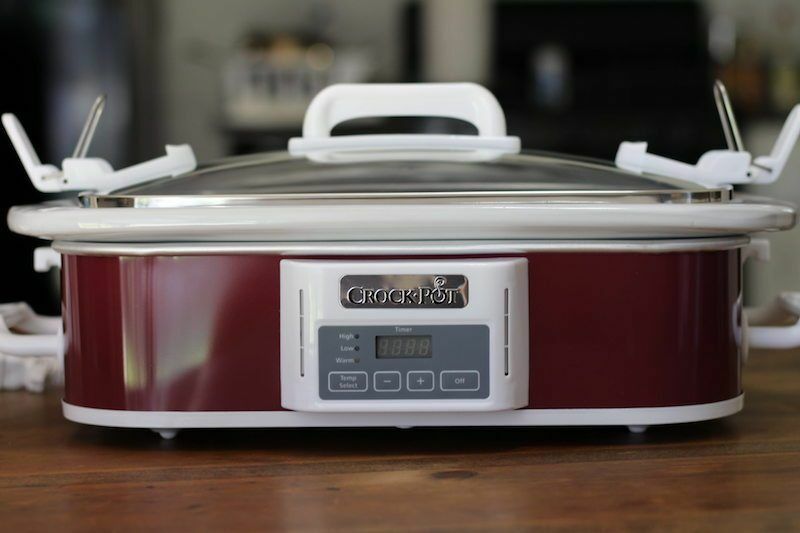 The slow cooker also features a mess-free locking lid as well as oversized handles, offering convenience when transporting your food-filled appliance. The removable stoneware insert and the secure-fit lid can easily be cleaned in the dishwasher. 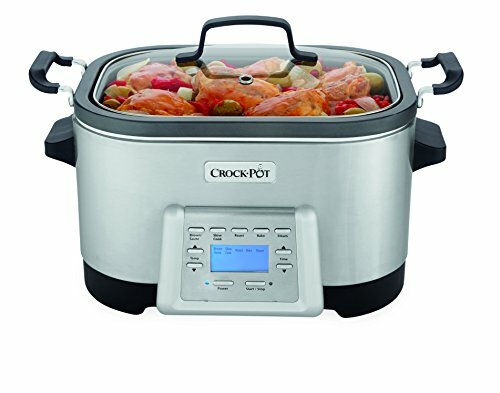 Although Crock-Pot offers multiple models within its Cook and Carry line, the six-quart capacity is the most popular unit and is, in fact, the overall best-selling slow cooker on Amazon. Consumers like the programmable time and temperature settings, the family-friendly serving capacity and the decent price. If you’re looking for a portable, mid-range appliance that offers the most bang for your buck, this product is worth considering. Featuring a manual dial with high, low and warm settings, this entry-level slow cooker has a round crock with a capacity of three quarts, which fits a three-pound roast. The see-through lid makes it easy to keep an eye on your dish throughout the day and the stay-cool handles adds convenience when stirring, transporting and dishing up. The removable stoneware and glass lid can be placed in the dishwasher. This basic model doesn’t come with any fancy programmable settings or savvy multi-cooking capabilities, but not everyone cares about those kinds of add-ons. Especially if you’re on a budget and you typically cook for only a couple of people, this bargain appliance can be a great addition to your kitchen. This pick is also an ideal choice for those who want to try out slow cooking without making a big investment just yet. Using the free WeMo app on an Apple or Android device, you can remotely control this technologically-advanced slow cooker through a 3G, 4G or Wi-Fi connection. From anywhere you get a signal, you can monitor the status of dinner while adjusting the cooking time and temperature settings and even getting notified when the dish is done. The model has three heat settings, which can be controlled through the app or the power button located directly on the cooker. With cool-touch handles, built-in cord storage and dishwasher-safe removable parts, this six-quart unit packs quite a punch. Although the WeMo slow cooker isn’t cheap, this smart appliance certainly offers capabilities most countertop cookers don’t provide. If you’re stuck at the office and want to delay dinner by an hour, switching the heat setting to low is no problem. In that same vein, if your kids never remember to turn the cooker off when they get home, it’s not an issue. You’re obviously out of luck if you’re on the go and lose your Internet connection, but if you’re a tech-obsessed consumer, you probably don’t stay a long time in a signal-free environment anyway. If you want remote-control access to the settings on your slow cooker, this unique model is a must-have. This rectangular appliance has manual low, high and warm settings to help you slow cook the perfect casseroles, lasagnas, desserts and more. The removable stoneware insert is a nine-inch by thirteen-inch pan that is oven safe, which means you can easily broil cheese on top of a slow-cooked dish or keep a baked casserole at a ready-to-eat temperature using the cooker’s warm mode. The model comes with a locking-lid system for convenient travel and both the lid and crock can go in the dishwasher. Having a casserole-shaped crock can be extremely useful when cooking certain recipes, but the non-traditional design obviously isn’t conducive for making every kind of slow-cooked dish. If you already own a regular oval crock and are looking to expand the number of appliances you have at your fingertips, you may want to pick up a rectangular cooker. Based on your preferences, you can pick up this manual model or a programmable version for around fifty dollars. 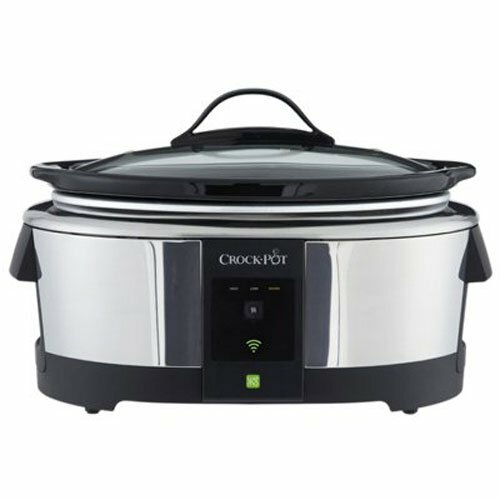 When it comes to Crock-Pot appliances, we love both the 5-in-1 Multi-Cooker SCCPMC600-S and the Programmable Cook and Carry Oval Slow Cooker CCPVL610-S. 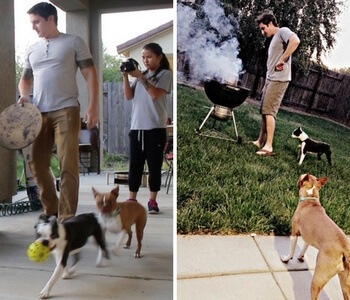 Both are family-friendly, six-quart models that deliver value. If you can budget in the splurge, we recommend going all out and buying the multi-cooker, which enables true one-pot cooking. Since the savvy appliance features a handful of different cook settings and can be used when preparing a wide-variety of meals, we think making such an investment will be worth it in the long run. Based on your cooking style, financial circumstances and overall preferences, easily you may have been drawn in by a different model mentioned in this list. Naturally, we think all of these Crock-Pot appliances are quality products that will serve consumers well. Whether you’re an app addict interested in the WeMo cooker or a bargain lover who’s eying the round manual appliance, we hope your days ahead are filled with good slow-cooked eats.